16hh WarmbloodXTB, has hunted and jumps nicely. Been a broodmare recently. Last summer got staggers around November so selling as broodmare only though can still be ridden. Romance is a beautiful bay dun filly, by Justa Lil PromisQs and Roma. She is sweet, has nice movement, and good conformation. She will grow to be around 15 hands and is very sure footed on our rough hill country. Romance will excell as a riding horse at shows or on a station. She loads, picks up her feet, and is being handled. Both parents 5 panel negative. Beyonce is a thoroughbred. Is broke to ride, used to be a polo pony. Easy to catch, sweet disposition, easy to handle, and is good for the farrier. She carries and cares for foals well. Will be sold in foal to Justa Lil PromisQs. 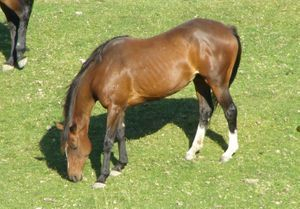 Not sure that we do want to sell this filly, will only go to the right buyer.